Admittedly, I haven’t been to many fine dining restaurants in Asia and thus my experience there is quite limited. But within the few places I’ve been it happened more than once that I got a mitigated opinion about the way degustation menus are being composed. Precisely, it appeared to me that effort is focussed on putting as many fancy ingredients together as possible – Foie Gras, precious hams, truffles or others – as if the only goal was to have a certain kind of glamour that diners might expect when they go to such a restaurant. The result is somewhat irritating to me as the whole dinner might comprise delicious dishes, but would lack of coordination between those dishes and more generally of sense as a whole. It still might be a dinner you’d quite enjoy but which wouldn’t engrave your memory with unprecedented sensations and impressions. Its fate would be inevitable oblivion among all other fine dining memories which impressed as a whole with a clear philosophy. But this restaurant was clearly not one of those. Without wanting to judge the talent of other chefs of course, this was one of the few where I had the impression of a clear philosophy. 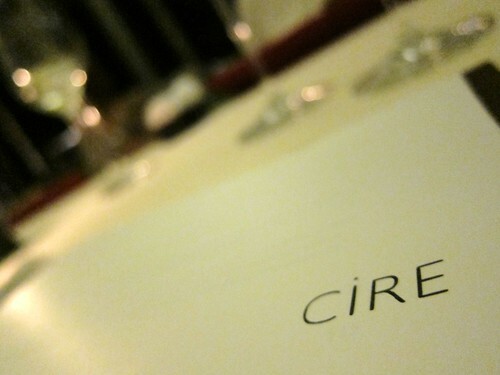 In fact, here at Cire, Dutch chef Stefan Zijta put a lot of thought and energy into the menu. 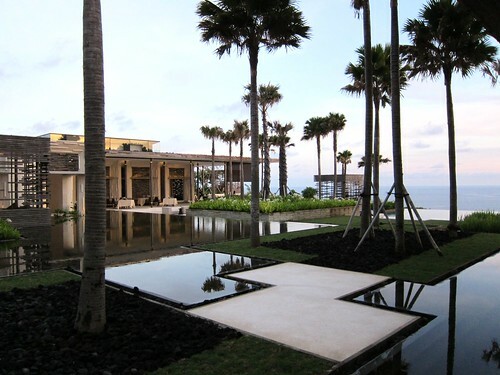 His philosophy emphasizes ingredients which can be found on the island of Bali – locally sourced products are the central topic of his menu. 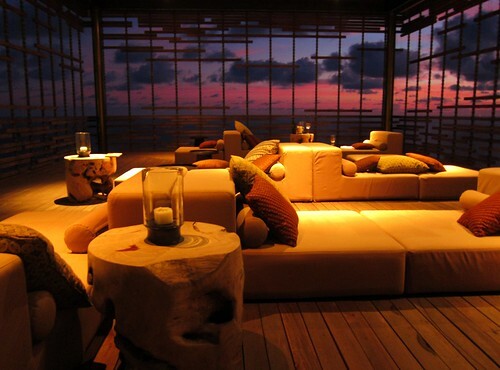 Therefore, before opening the restaurant, he first had to explore the island and search for inspiration. 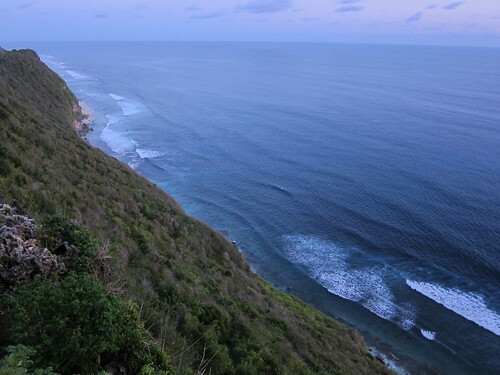 Of course he found many specialties on this rich island, also some that he couldn’t serve at the restaurant for obvious reasons such as turtle meat or coconut crab (protected species). He retained the most appropriate in terms of taste and qualtity and made it his goal to only used Western products where it makes sense. Discovery and sustainability might be the keywords here. 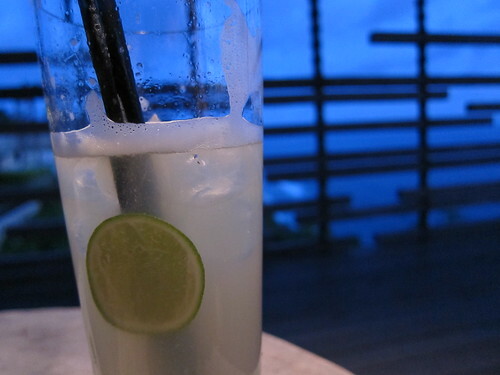 We planned to arrive at the resort for sunset-drinks and dinner in the Warung restaurant. 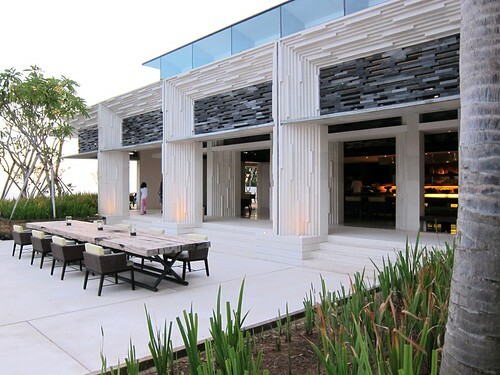 When we were finally there we realized that the second restaurant of the resort – “Cire” – was the one concentrating on fine dining we quickly switched there. My brother and I opted for the 5 course degustation menu for 635 000 Rupiah (approx. 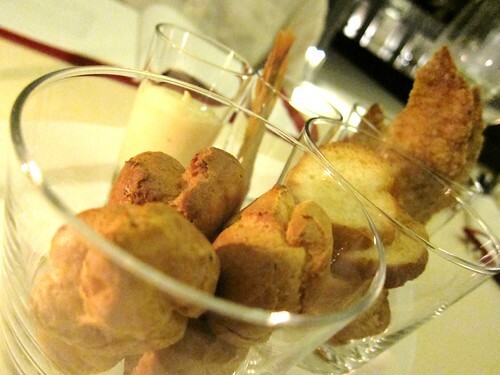 45 Eur; 3-, 4- and 7-course menus are also available) whereas other diners chose à la carte. The following pictures describe the degustation menu. 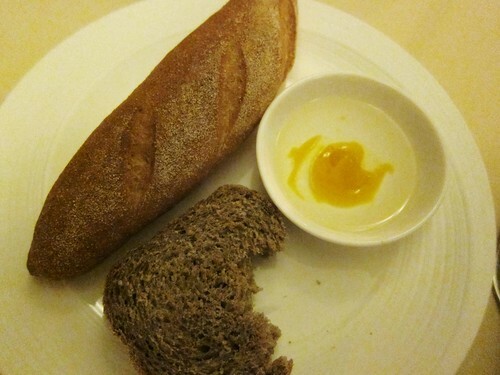 Some breads were served to entertain us while we studied the menus. I remember some crackers with fennel seeds that were delicious when dipped in smocked mackerel cream. Amuse: Cucumber with Tuna broth and black sesame seeds. 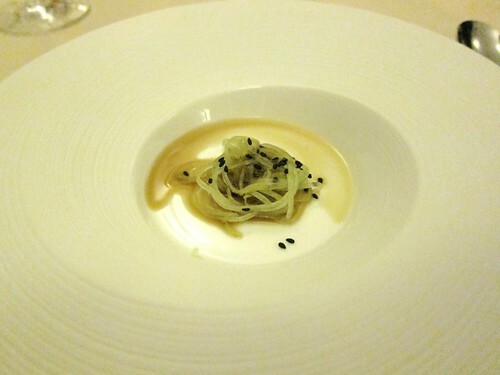 The tuna broth or consommé was rich and pure, so intense it nearly tasted like beef – amazing. The effect on the thin cucumber slices was quite interesting. It made them taste subtle -nearly not recognizable as cucumber- as if their usually powerful flavour could be dimmed with tuna broth. the thin cut also gave it a velvety strucure. This nibble kicked off the meal in a delicious thought-provoking manner and seemed to announce a menu with very pure and natural flavours! 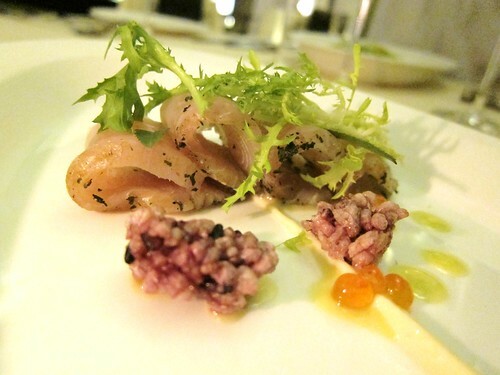 Mackerel – marinated and served with salmon roe vinaigrette, black rice crispies and smoked mackerel cream. 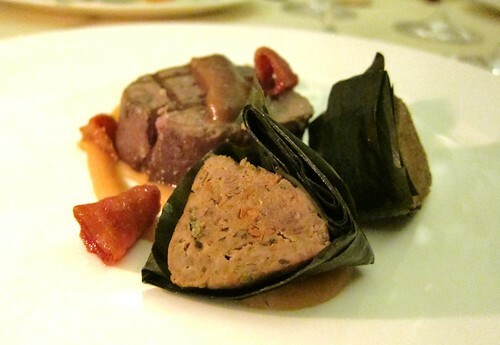 With this dish contrasts of flavours and textures were intensified a little, as if we put the next gear. 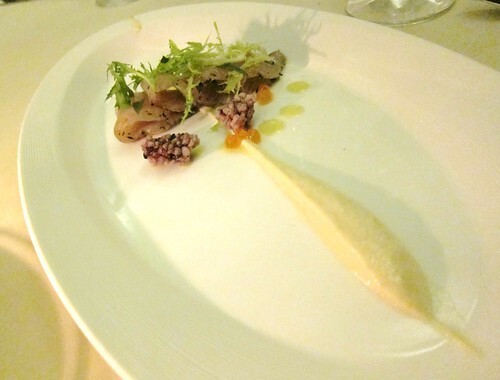 We stayed on subtlety though with delicate marinated mackerel again suggesting purity and which was condemned to deal with a more intense flavour of the smoked mackerel cream. This interaction worked very well. And here and there a popping salmon roe would add punctuation into this poem. The rice cracker added crunchy structure but wasn’t relevant in terms of flavour – maybe some flavourfully infused crouton would have worked better instead? But without a doubt I enjoyed the compositon very much – also because I felt and agreed with the idea/the plan behind it! Duck Terrine with orange vinaigrette and home smoked duck breast . Now here we have a totally different character since it was evidently a little more rustic than previous dishes. 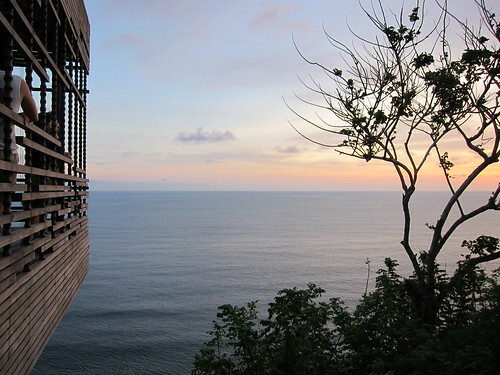 But it depicts another side of Bali that couldn’t be let out: the exotic side, with ripe fruit aroma and natural sweetness. We’re also coming back to the earth after having had the sea. This is a heart-warming dish with no big surprises. 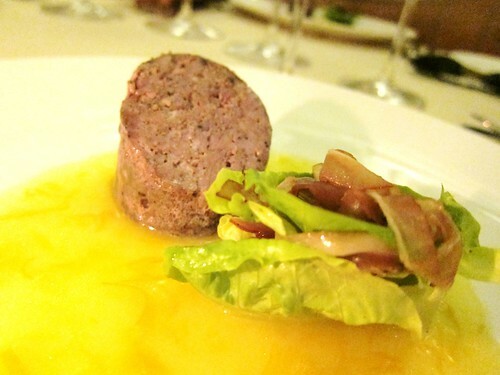 The terrine is well made in taste and structure and works perfectly with the fruity orange vinaigrette. This is one of the details that showed how much Stefan Zijta tries to be consequent in applying his philosophy. He found a Balinese answer to serving bread with olive oil and balsamico by serving it with passion fruit purée in coconut oil! Again something intriguing and it works well! It once more underlines the exotic side of the island and more generally depicts its richness in natural ingredients and its gastronomic potential. 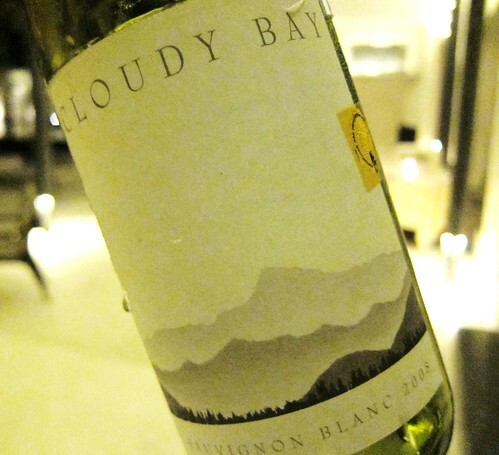 2008 Cloudy Bay Sauvignon Blanc from New Zealand is a classic. It really needs a lot of whirls in the glass to show its richness. Otherwise you’ll be disappointed by only noticing its rather harsh acidity. Gindara- Curried and seared, with ginger beurre blanc, palm hearts and carrot puree. 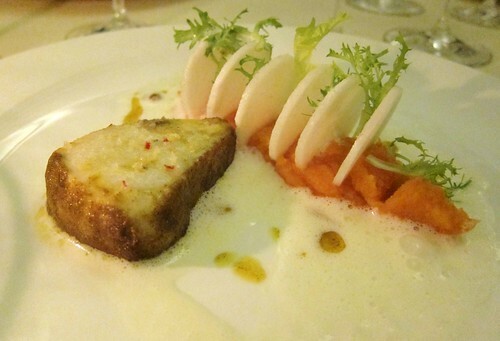 Gindara- also called Sablefish is a variety I never heard about before. It has a quit firm but delicate flesh. The sides had a spicy crust and interacted beautifully with the purity of the ginger beurre blanc. However the very subtle ginger flavour was a bit overtoned by the carrot purée which was good but not quiet enough in my opinon -I’d think it a little over. Probably something subtle and earthy instead would fit great? -Kohlrabi? Navet?- or a simple potato purée? Also the value of the salad leafs is disputable. For my taste, it is superfluous decoration. But the combination of the fish with ginger beurre blanc is truly an inspiration. 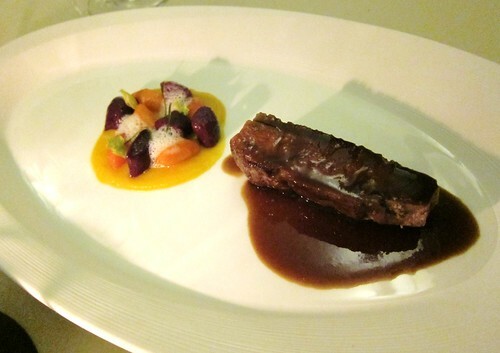 “Bandung” duck – seared duck breast, with sweet potato gnocchi’s, glazed carrots, pumpkin puree and cinnamon sauce. This was again a dish depicting the luscious exotic side of the island. The duck meat was perfectly seared, the cinnamon sauce had something heart warming and at that time of the year reminded me a bit of Christmas. 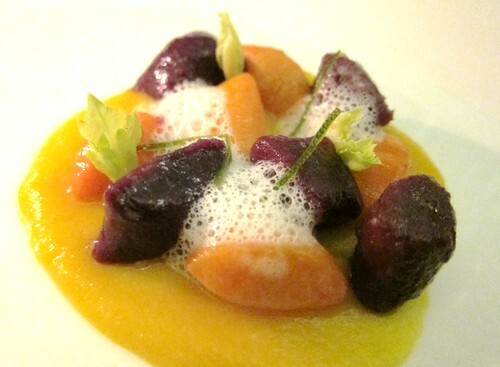 The sweet potatoe gnocchi, pumpkin and carrots added to the very generous feel of the dish. Needless to say, this complemented very with the Australian Cabernet wine. 2004 Will’s Domain Cabernet Sauvignon from Margaret River was a solid red that profited from decanting and was then just right with the duck. 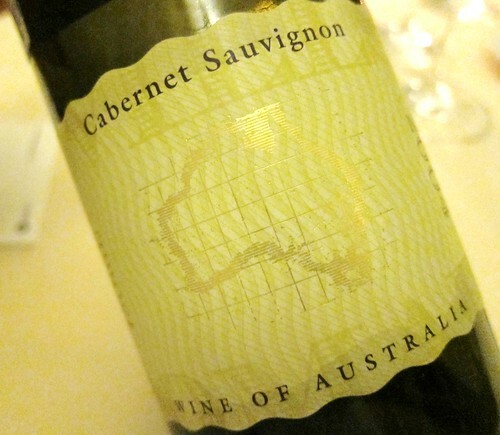 Another nice encounter with Australian Cabs for me, of which I honestly don’t know much about. 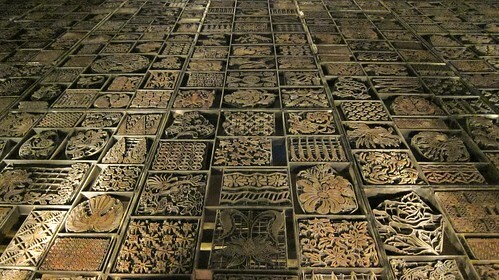 2500 Batik Stamps decorate the walls of the wine tasting room. 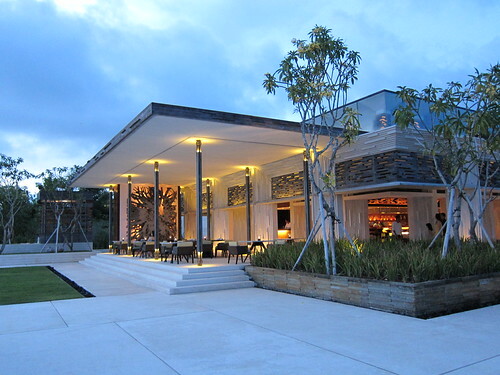 The restaurant name Cire refers to the local Batik techniques. The savory part of the menu ended here for us. After a nice chocolate and coconut dessert of which I forgot to take a picture we had time to ease down and meditate about the food over a glass of smooth Arak, the locally distilled alcohol. Personally, I preferred the more subtle dishes without the exotic fruit touches. The Mackerel and the Gindara really showed a natural and pure taste and have been complemented with subtle flavors to create compositions that made an impression on me. 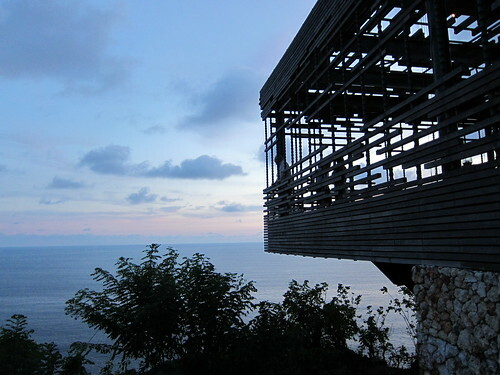 I totally acclaim Stefan Zijta’s philosophy, trying to explore the islands rich and sometimes hidden resources for procuring intriguing yet delicious sensations. In some ways I had to think of Noma’s René Redzepi who travels Denmark for finding new or forgotten ingredients for his high end restaurant. Could this be an indication of where Stefan Zijta’s cooking is leading? Conclusively I can only recommend you’d try out his cuisine by yourself. I’m quite sure you won’t be disappointed and I’d be more than curious to read some more blog opinions about it. By the way, I solely talked about the cooking for now and thus omitted to mention something truly crucial about this place, something that hits you right from the start when arriving there: the setting. It simply is stunningly beautiful! And this is something that also counts when you judge on the quality of a restaurant right? 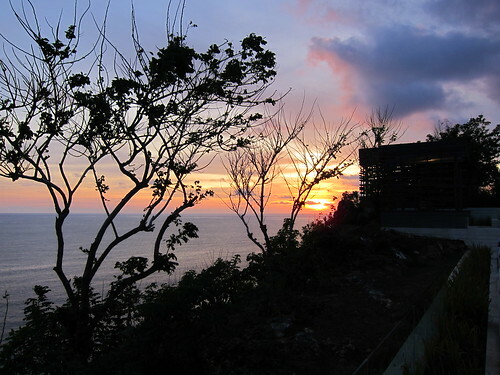 The whole resort is located right next to the ocean, but not on a beach, it is rather suspended on a hill right before a steep cliff maybe 40 meters above the water. 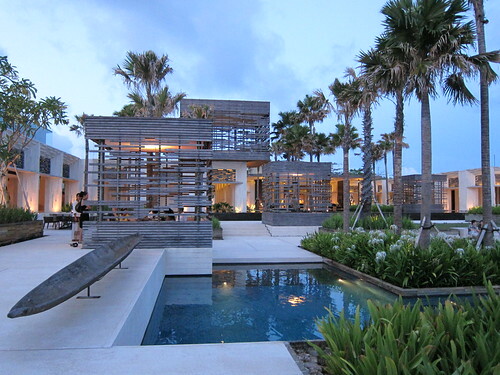 Also the Singaporean star architects have designed open and closed structures that seem both puristic and natural, with cool white stones and clear lines as well as warm woods. 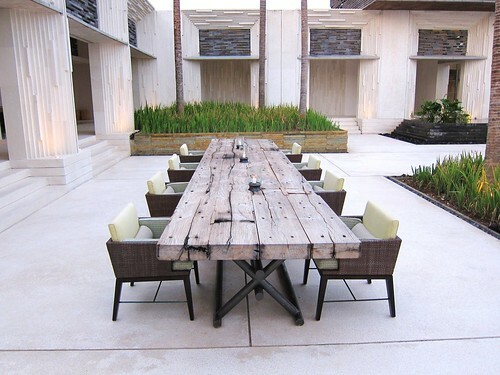 Some elements dispersed within the space are evoking the islands craftsmanship. The other restaurant of the resort – The Warung – offers more down to earth specialties like Satay or -so I read- a Babi Guling burger filled with the meat of the famous roast Balinese suckling pig. Here are some pics of the Warung. Na, das ist ja alles ganz nach meinem Geschmack. 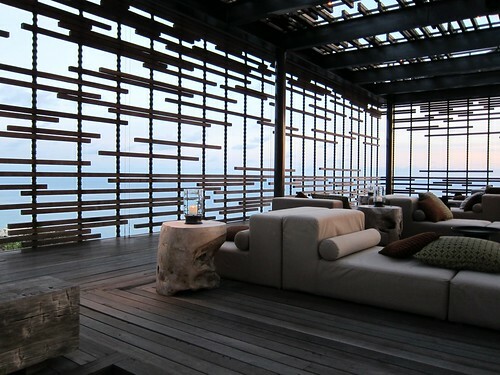 Coole location……..
Allein für den Blick aus der Lounge lohnt sich die Anfahrt schon! Wow, Alex this is just amazing. And of course the way you captured it is great too. Keep it on! Thanks Philipp! ;P I used my new compact camera.. it does a good job in low light.